Turn up the heat with a spicy fish recipe. 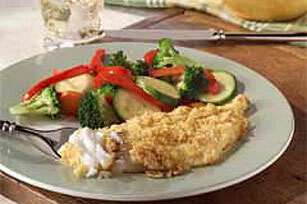 A dash of ground red pepper in the crumb coating adds heat to the fish fillets in this this Quick & Spicy Fish. Mix cheese, corn flake crumbs and pepper in shallow dish. Dip fish in egg, then in cheese mixture, turning to evenly coat both sides of each fish fillet. Bake 5 to 10 min. or until fish flakes easily with fork. Substitute any fine-textured fish fillets, such as sole or cod, for the flounder. Substitute boneless skinless chicken breasts for the fish. Decrease oven temperature to 400°F. Bake 15 to 20 min. or until chicken is cooked through (170°F). Looking for tasty ways to incorporate fish into your healthful eating plan? Ground red pepper adds a little zing to this easy entree. In addition, the KRAFT Grated Parmesan Cheese provides calcium!